We're home remodeling experts who design and build custom kitchens, baths, and home additions in New Jersey. 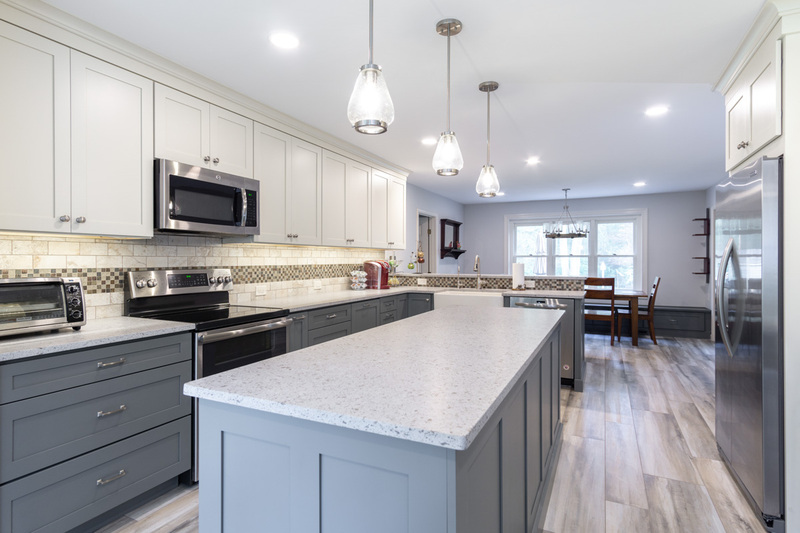 We’re an award-winning and family-owned custom design & build home remodeling group that helps New Jersey homeowners just like you make their home remodel dreams a reality – and we’ve been doing it since 1968. And if there’s one thing we’ve learned over our last 50 years in the home remodeling business, it’s that a happy customer is a great customer and we’re committed to ensuring that every Amiano Customer is a 100% Satisfied Customer. So when you’re ready to transform your home into the home of your dreams, we’re here to help you along every step of the way. That’s the Amiano Guarantee! John Blyzniuk is a USMC Veteran who served two tours of duty in Iraq. He’s also the father of three kids and the husband to a wonderful mother right here in New Jersey. His service to our country left him with Post Traumatic Stress Disorder, a disorder faced by more than 8 million Americans. We teamed up with Nation Gypsum and the PURPLE-TO-PERFECT Home Remodel Contest to give this deserving Marine an incredible space of his own to relieve stress and give him a space to enjoy his hobby of weightlifting and personal fitness. We converted his two-car-garage into an awesome man cave and home gym so that he has his own place to unwind. It’s just our way of giving back to our local community and doing what we can to say Thank You to our Nation’s bravest men and women. Kitchen Remodeling is one of the most popular home remodeling projects we encounter. And when you think about how much waking time we spend in the kitchen, there’s a pretty good reason why. The kitchen is the heart of your home. It’s where your family comes together for wholesome meals. Where we have our deepest conversations. Where we laugh until we cry, and sometimes cry until we laugh. It’s where our best memories are often made. So when it comes to building your dream kitchen, make sure it’s a remodel worth remembering. Bathroom remodeling is one of the most beneficial home remodeling projects when it comes to personal relaxation and health. We’re at our most vulnerable in the bathroom, and it’s one of the places where we are most comfortable letting the day’s stress go. A long soak in a warm, oversized tub or the gentle patter of a beautiful rain shower head is the perfect ending to a long day. Let us help you find your relaxation space with a beautiful bathroom remodel design. Home Additions are the perfect answer to your growing family woes. Whether it’s an extra bedroom, sunroom, or an entirely new wing, our designers create the perfect design to match your home and meet all your needs. It’s also the perfect answer to increasing your property value before selling. Home Remodeling can mean different things to different people. Maybe you’d like to expand your living room or remove some walls to give your home an open floor plan. Or maybe you’d like to update your home from basement to roofline. We have the experience and know-how to completely transform your home. An Amiano Client is a 100% Satisfied Customer! Our customers mean the world to us. You and your project are special. We’ll always go out of our way to provide you the personal, respectful, and honest service that you deserve. But don’t just take our word for it, our customers are happy to tell you themselves. Every Amiano Project begins with a complimentary on site consultation. Finalize your detailed project and design and gain an understanding of your investment. Amiano begins building your dream home remodel. Our Production Team inspects your near finished project. Amiano celebrates your Grand Finale with you. Buying commercial properties With so many small businesses in New Jersey now is the time to invest in commercial property.